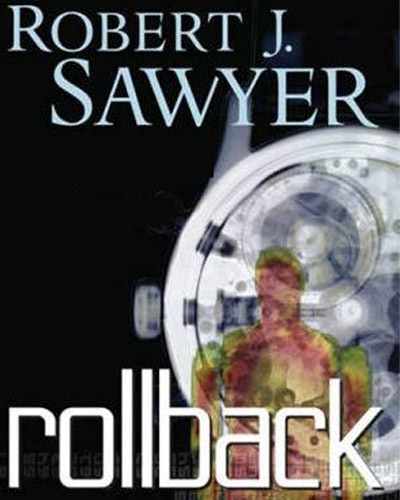 Canada’s book reading radio show, Between The Covers, has just finished adding all 25 parts of Robert J. Sawyer‘s novel Rollback to its podcast. For my own listening pleasure I’ve gone through and stripped out all the intros and extros so as to make it into one big clean audiobook file. Downloading the files from the feed (or HERE), dragging them into Audacity (a free digital audio editor) one at a time and snip-off the first and last 30 seconds (or so from) from each file. Then plop the resulting (shortened) MP3 files into another piece of software called MP3 to iPod Audiobook Converter. Export as one big M4B and drag into itunes under as a single new playlist. The above may seem slightly complicated (at least the first time around) but it’s not really that tough and it will improve your enjoyment of the audiobook. Alternatively, I think Julie from Forgotten Classics has figured out a similar (or reverse) system using iTunes 9. That might work. But myself I like the idea that I can drag a single DRM-free file into Skype and send it out immediately to a friend (who uses iTunes) and have it show up in the right category, ready for bookmarked listening. So, get downloading from the feed people! And hurry it up, because those files will only be there for a limited time – and that’s your only option at this point, at least until some thoughtful person (cleverer than me in the ways of torrent assemblage) puts a tracker for the novel up on RadioArchive.cc website. CBC should really be doing it actually, but that’s probably expecting a little to much at this point. It’s 2009. 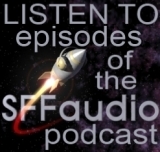 Sarah Halifax decodes the first radio transmission from aliens. Thirty-eight years later a second message is received and Sarah – now 87 – may have the key to deciphering this one too …if she lives long enough. What would you do differently if you suddenly had another 60 or 70 yrs of life? Hugo and Nebula award-winner Robert Sawyer explores ethics on both the human and cosmic scale in this novel about becoming young again. P.S. CBC is still sitting on it’s J. Michael Straczynski radio drama series. I protest this inaction! Do something with it CBC! Lord have mercy! To think I almost missed this! Thanks for the heads up and yes I do go backwards sometimes, but I also go in your direction using that nifty software. hey! thanks for the audio tools link! Half way through – good novel – my only criticism of the narration so far is that “Mennenga” and “Evo Terra” were both pronounced incorrectly. I need episodes 1-5 which have rolled off. Does anyone have backup? ps radioarchive ( I amd member there) doesn’t have it. I have no idea what Skype is. some kind of communication software on the net? I will check it out but I thought that is something people have to pay for? I ‘m listening to chapter 14 right now, interesting style the author ahas – I’ can pick up the introduction 5 chapters afterwards. Thanks – I can torrents or file transfer if you can. Each chapter is about 7 M so I think that is 35 M.
Skype – i see it’s internet phone and it’s a lifestyle cost thingee. Sorry it’s not something want. Can you communicate by Email Jesse? Skype is free, and has a file transfer service. Typically files of MP3 size are too big to send via email.